Alexis Rose Lash & Beauty Suite - An expert Lash Suite specializing in the art of lash extensions and permanent makeup. 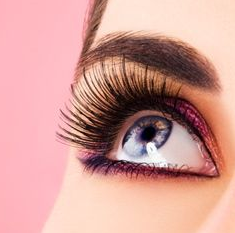 Lash extensions are made of synthetic, mink or faux mink lashes. Lashes come in vari ous thicknesses, curl and color to give each client a customized unique set of lashes. An EyeLash Extensions full sets includes lash wands and care card instructions. Also check out the brow services here. Taking care of your skin is the best way to keep skin young, healthy and rejuvenated. If you are experiencing skin concerns, interested in routine beauty maintenance or just a glowing sunless spray tan, we can help you look radiant. We are pleased to offer a great customized treatments by our licensed master esthetician. Accentuate your beauty in minutes with a new look, make up lesson or be prepped for your big day as a bride. We enjoy making each client fall in love with the skin they are in with a little touch of glamour.